Sarah Nader- snader@shawmedia.com Fourth-grade students, Annaliese Harper (left), 10 and Maggie Becker, 9, both of Lake in the Hills, laugh while guest reader, Ryan Kunde reads, "Are You My Mother?" to the fourth-grade class at Martin Elementary in Lake in the Hills Thursday, March 20, 2014. The school set a new record by utilizing over 80 guest readers throughout the day during Reading Week at the school. Sarah Nader- snader@shawmedia.com Officer Christina Busby reads a book to a fourth-grade class at Martin Elementary in Lake in the Hills Thursday, March 20, 2014. The school set a new record by utilizing over 80 guest readers throughout the day during Reading Week at the school. Sarah Nader- snader@shawmedia.com Ryan Kunde reads, "Are You My Mother?" to the fourth-grade class at Martin Elementary in Lake in the Hills Thursday, March 20, 2014. The school set a new record by utilizing over 80 guest readers throughout the day during Reading Week at the school. 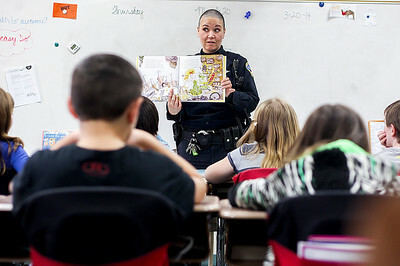 Officer Christina Busby reads a book to a fourth-grade class at Martin Elementary in Lake in the Hills Thursday, March 20, 2014. 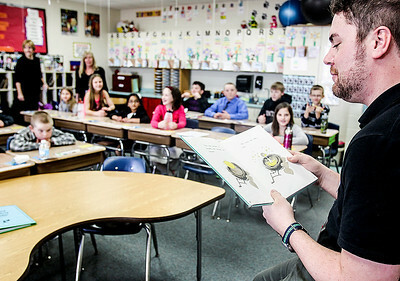 The school set a new record by utilizing over 80 guest readers throughout the day during Reading Week at the school.